Are you among those who think that marketing & branding is the same thing? Have you been doing your marketing thinking that you are doing the branding too of your company? Well, then let me tell you that you have got it all wrong, there is a whole lot of difference between the two. Branding is who you are and marketing is how you build it. Branding is strategic, while marketing is tactical. Let’s dig deeper into each of the two. 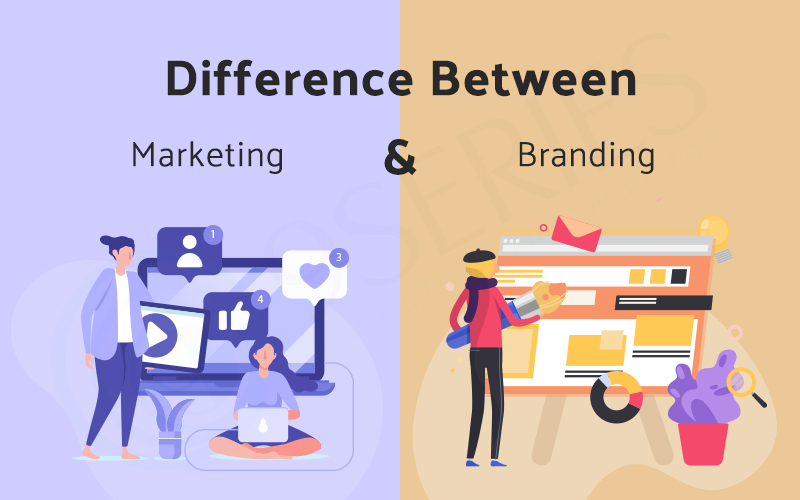 As a digital marketing agency, you must know & be able to tell your clients the difference between the two. Marketing is the process used to build a connection between the customers & the company. There are many activities like advertising, selling, exploring, creating products based on the demand adding to the company’s profit. You can use a variety of strategies and platform to market your company’s products or services. Before we jump to branding its pivotal to know what is a Brand? A brand is the name, logo, sign, or a slogan of your company that has impacted the human minds and leaves a print forever. It is what helps the consumers recognize your company when you sell or promote your products or services. Branding is doing activities that create that image or leave an imprint of your company on the consumers. A brand is a brand because of many things. First and foremost the promises it makes and keeps. Secondly, the standards it maintains to keep it as a brand, and thirdly, the marketing team does not promote any product or service in a way the brand cannot fulfill. No false marketing tactics are used by a brand, they actually don’t need it. Marketing is actively promoting a product or service, sending across the message to the targetted audience. You may use different ways of marketing. One such way could be having celebrities in the ads or using social media, but because of a celebrity it will not be a brand, he/she is only promoting it for you. A brand is bigger than marketing tactics you use to contribute to making it more known. After all, the marketing efforts what is left is the Brand. Marketing tactics you use is what prints the brand in the minds of the users. So, they aren’t similar at all. A brand will ensure the loyalty of a customer to it, while marketing will push a customer to buy the product or services. But, whether you buy it or no will depend on what kind of a brand it is. When we go shopping when there is a heavy discount, we will look for discounts on the brand we use, because we trust its quality and more importantly we trust the brand. It is the brand that encourages you to buy something, marketing only pushes you towards it. This is the biggest difference between marketing & brand. ~ Where branding brings reputation, marketing increases sales. ~ Marketing is a set of activities done to bridge the gap between the customer & the company, while branding is a practice to naming a product in such a way that consumers connect to it and can recognize it every time they hear or see it. ~ You make a brand for the customers, but you do marketing for the company. ~ Marketing adds customers, while branding builds trust & customer loyalty. ~ Marketing promotes the value of the product, while branding creates the value. ~ Marketing targets potential customers, branding targets emotions. All businesses run in the same way, because all need to sell, either their products or their services. What strategies they use to sell might differ from company to company, but their actions decide whether they have built or destroyed the brand. Every action or marketing activity carried out leads to either adding more loyal customers to the brand or cutting them off. If marketing is pushing the customers then branding is pulling the loyal customers towards it. Marketing plays a strong role in influencing customers to make the buying decision, while a brand influences the buying decision of the customer by leaving its impact on them. According to OnBrand more than 70% of brand managers feel that building, an audience is more important than increased sales. This clearly states that both are different. One does marketing to increase sales, but if you have already built your audience means you are already a Brand and your marketing techniques will work perfectly fine. Branding & Marketing are two different things used for different purposes. Branding is used to make, communicate & deliver a promise made by the brand and is a long-term commitment. While marketing is used to communicate and connect with prospective customers who will have interest & benefit from the promise made by the brand. Marketing helps you to make a sale whereas a brand enhances the customers to buy the product because of the brand’s promise & reliability. Being recognized as an online marketing agency in India we ensure to know the difference between the two. We know the value of a brand and hence we carry out our online marketing activities based on the requirement and popularity of your company. We work towards building your online presence and leaving a positive impact on your target audience.